What have I done with the Raspberry Pi? Built a stratum-1 NTP server with microsecond-level offsets and a power consumption of less than 4 watts. The Web page has information about interfacing a GPS receiver to the Raspberry Pi, choosing between various receiver options, and how to compile NTP from the source for added options. I hope you will find the page interesting, and perhaps build a GPS-locked stratum-1 NTP server yourself for your own network or perhaps for portable operation. GPS receivers similar to this have been used in the recent Babbage adventure - the Teddy who jumped from Space - about which you may have read in the Telegraph, the Independent, or seen on the BBC. 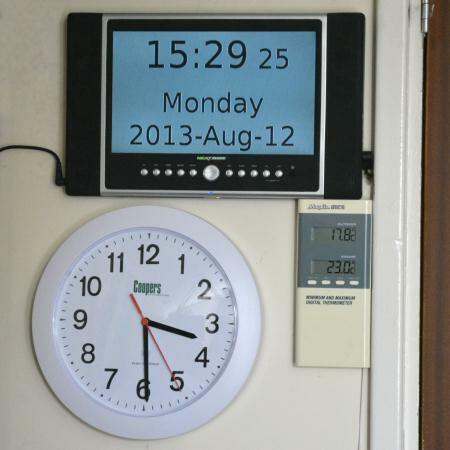 Built a Digital Wall clock using the Raspberry Pi - synchronised with NTP, of course! The Web page discusses setting up the Pi to just fill the analogue TV screen, and uses a high-performance programming language (Free Pascal with Lazarus) which can work on Windows, the Mac, or on Linux. dump1090 - receiving aircraft location signals on 1.09 GHz with a cheap TV dongle and feeding the results to Plane Plotter over a Wi-Fi link, in a server-client configuration. This allows you to put the receiver right up close to the antenna, avoiding an expensive (or lossy) piece of cable, and avoiding the need for a cable run at all. It's not much more than following someone else's instructions, but at least I can vouch for every command on that page, and perhaps you will find something useful there. Using an Airspy - A development of the software above, airspy_adsb is advanced version of ADS-B software, designed to work with the Airspy hardware. This combination provides noticeably better performance than the usual RTL dongle, but requires a model 2B Raspberry Pi so that it can run several threads simultaneously. Personal Seismograph - I bought one of the RaspberryShake board & case and can I can see earthquakes across the world - well, at least if they are string enough! 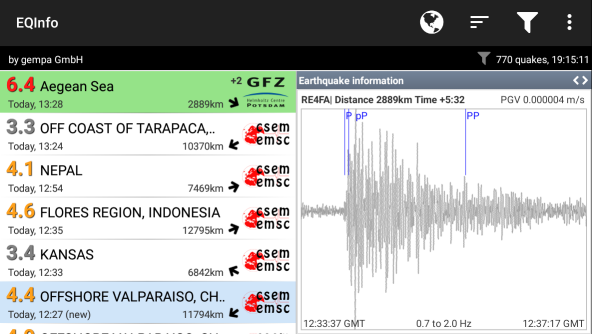 Here's the Greek earthquake from 2017-Jun-12 at 12:28 UTC (time is shown as local time at 13:28 UTC+1). The output is shown on an Android app on my phone. You can see my current status here. Monitoring the Raspberry Pi - as most of my Raspberry Pi cards are used headless - i.e. without a keyboard or monitor - I wanted to monitor what was happening remotely to keep an eye on resource usage. In addition to monitoring the NTP Server operation with standard NTP commands and Perl scripts, I've added general SNMP support (Simple Network Management Protocol) which allows monitoring of the network I/O, disk space, CPU temperature and, with a little additional hardware, ambient temperature monitoring as well. 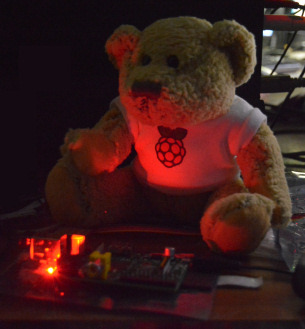 A Raspberry Pi illuminating one of Babbage Bear's brothers. Babbage is the bear who jumped from 39 km to set a world record!